220 volt, 4 batteries charged by: engine, shore power, generator MITSUBISHI GE 3 cyl. Aft of the shower room are two single cabins with beds 2m x 1.05m and a desk in each. The whole living area is heated by radiators from an oil fired boiler which also heats the domestic hot water. Live aboard barge for sale in France. 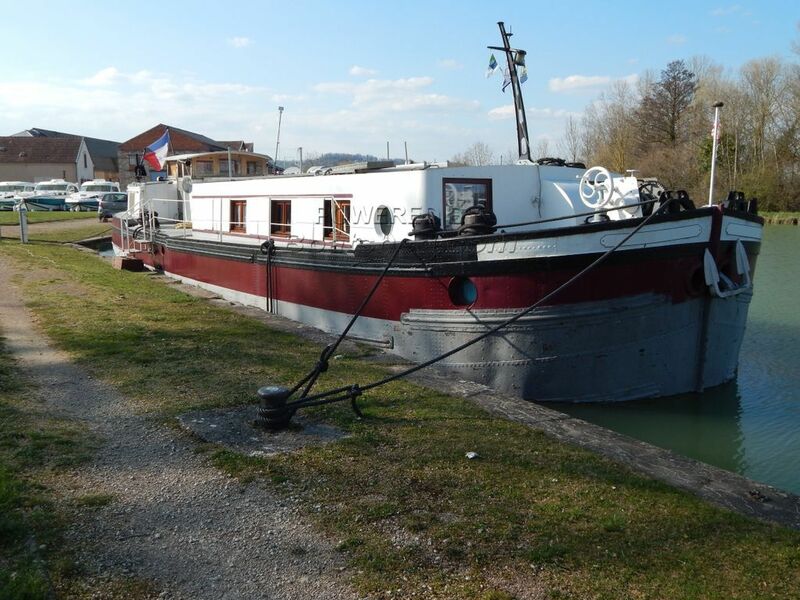 Boatshed Bourgogne is pleased to offer this residential barge for sale in Burgundy. Owned by a highly experienced professional the boat has always been maintained to Certificat Communautaire standards and maintenance is on-going with new batteries and new AIS purchased in 2017. Practical accommodation and manageable dimensions plus the classic Midi barge looks make this an interesting proposition for long term cruising or full time residential use. For more information and appointments to view, please contact Graham, your local Boatshed broker at Boatshed Bourgogne. This Barge Live Aboard PENICHE DU MIDI has been personally photographed and viewed by Graham WHARMBY of Boatshed Bourgogne. Click here for contact details.